The advance of technology has transformed the way restaurants and hotels operate their businesses. When almost everything, from reservations, productions, and service delivery, to the collection of payments, can be performed by machines, restaurants and hotels must also reconsider how they may better utilize the space for smooth operations. 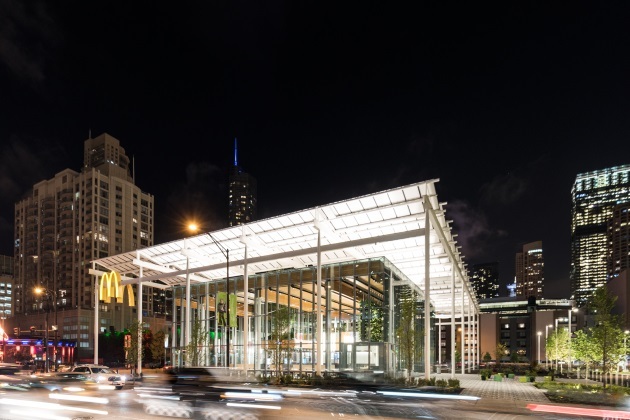 McDonald’s, for example, recently revealed a flagship store that looks like an Apple Store in Chicago, roughly two months after the company opened a brand-new, $250 million headquarters in an up-and-coming Windy City neighborhood known for its trendy restaurants. The restaurant is located in a glassy, 19,000-square-foot building. More open space is featured for self-order kiosks, mobile order and pay, delivery, and even table service. Table service is offered with digital ordering options. Currently, about 5,000 locations in the U.S. fit the qualifications for such table service. The restaurant highlights the sustainability efforts taken by the company, featuring over 70 trees at the restaurant’s ground floor and on-site solar panels. Along with the new flagship store, McDonald’s announced its plan to spend $6 billion on nationwide restaurant makeovers. This project, which is expected to be completed by 2020, will transform most of the company’s restaurants through construction and modernization. Modernized dining room with new furniture and globally or locally inspired décors. Additionally, McDonald’s has introduced McDelivery with Uber Eats at over 5,000 U.S. restaurants to embrace the food delivery trend. Even though some critiques believe McDonald’s initiatives of making over its stores are only playing catch-up, I believe such changes are critical for the company to update its image. Plus, it is time for restaurants to reconsider how they better utilize the space to optimize their operations. Hotels are also updating their services and space in responding to the shifts of customer base and demands. Some hotels, for example, added more local flavors into their designs. It also becomes essential for hoteliers to make a space "Instagram-ready" when more travelers rely on technology in travel planning. Other hotels incorporate the healthy living concept into their services. Recently, Hilton introduced the in-room fitness concept, allowing travelers to do exercises inside the newly renovated Hilton guestroom in select locations. Westin also has a similar program called The WestinWORKOUT room. What are the essentials for restaurant designs and hotel designs? What are your suggestions?